It is just out of the dryer (I always wash and dry quilts when I finish them…I like the puckery soft look from the slight shrinkage of the cotton batting) so it is still a bit wrinkled. The wrinkles will hang out but I couldn’t wait to take some pictures! I didn’t count the hours it took and I am not sure I want to know! I know that I used 4 spools of thread with 350 yards per spool to do the hand quilting so that makes it 1400 yards. I didn’t mark it for quilting I just eyeballed it but the echo quilting is about 1/4 to 3/8 inch apart. 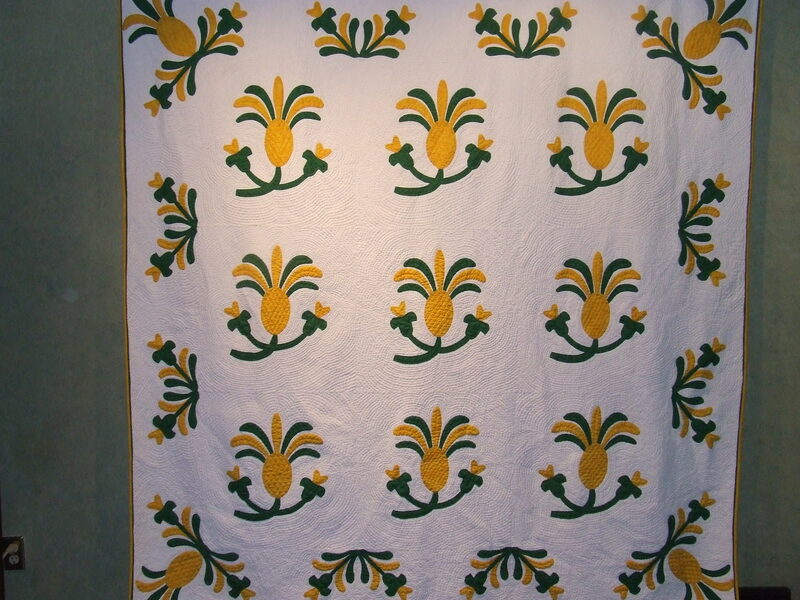 “Collection of the New England Quilt Museum”. I have to make my quilts different from a set pattern so for this one I added the border applique. 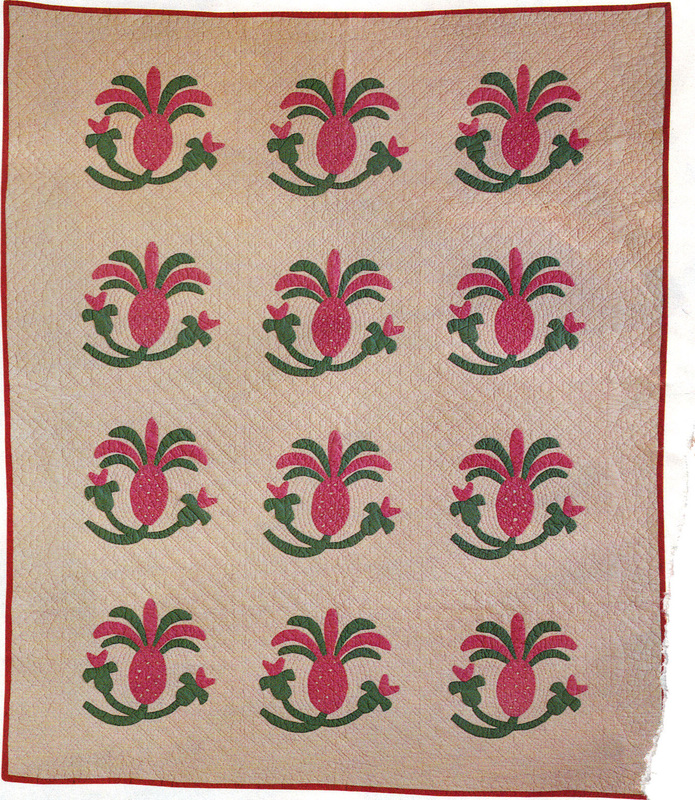 The antiques added texture to the pineapples by piercing the applique (making holes) I simply quilted the pineapples in a diamond grid. The green treatment on the binding is a 1 inch strip of fabric folded in half and sewn to the edge before the yellow binding. I am so glad that it is done! and so pleased with how it turned out….I dont often do applique but after doing this one I know I will be doing more! 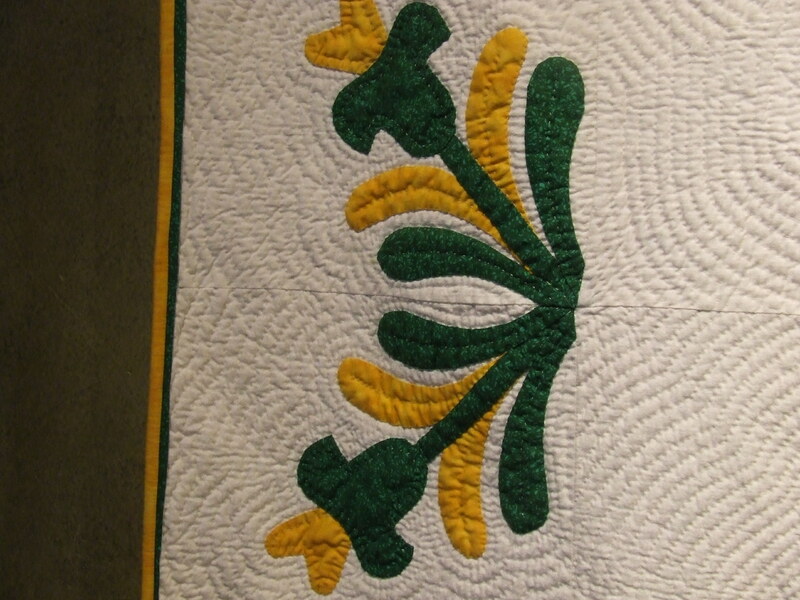 This entry was posted in Quilts and tagged antique quilt, Applique, hand quilting, Quilting, Quilts. WOW – congratulations! It looks great. I can’t believe you can work with Warm and Natural. 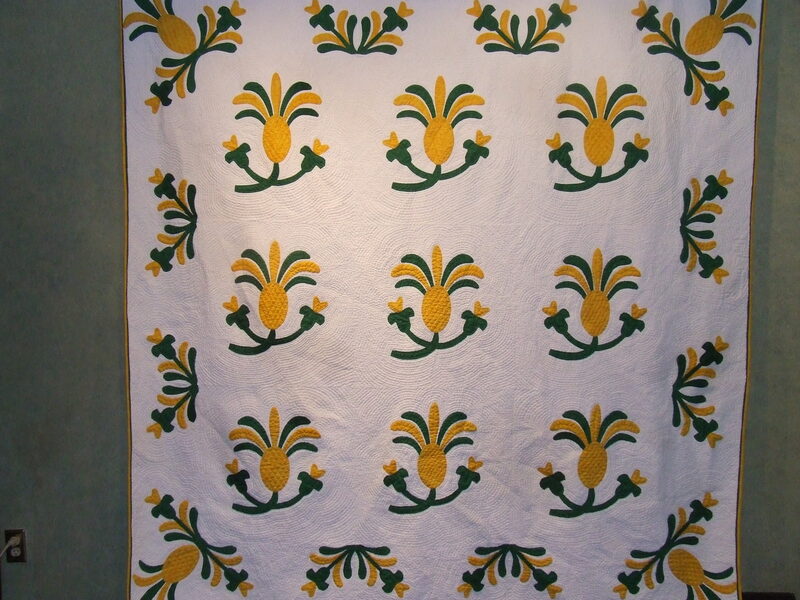 I can’t hand quilt that – I use it only for wall hangings. Do you stab stitch or stack several on your needle? Isn’t it fun to quilt without marking? I’m with you on washing a quilt when I finish it. I take it out before it’s totally dry and lay it flat on a clean sheet – and sort of block it by just smooting it out and straightening corners. 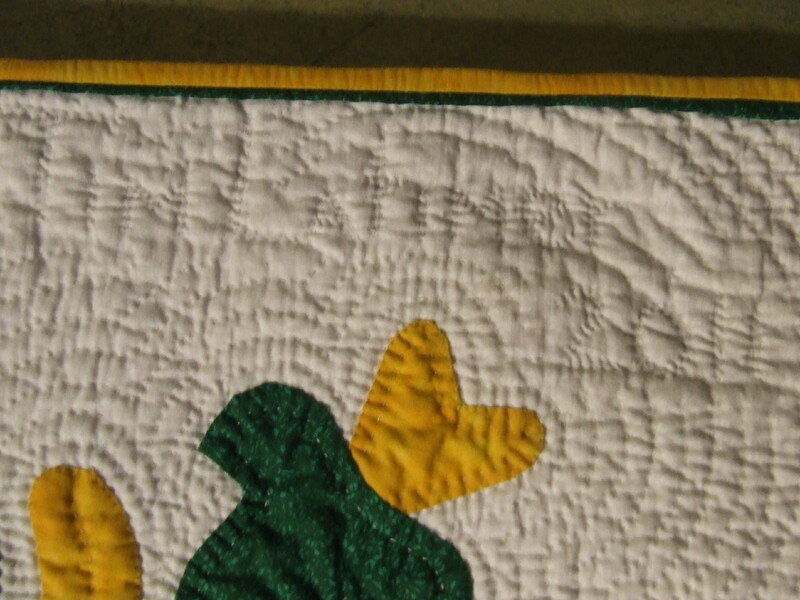 The quilting shows so much more after washing. You inspire me! And thanks for the drying tip! Yahoo! Congratulations, Tim! It is simply gorgeous! I love it but I am so glad it is done! Congratulations — that is absolutely gorgeous! 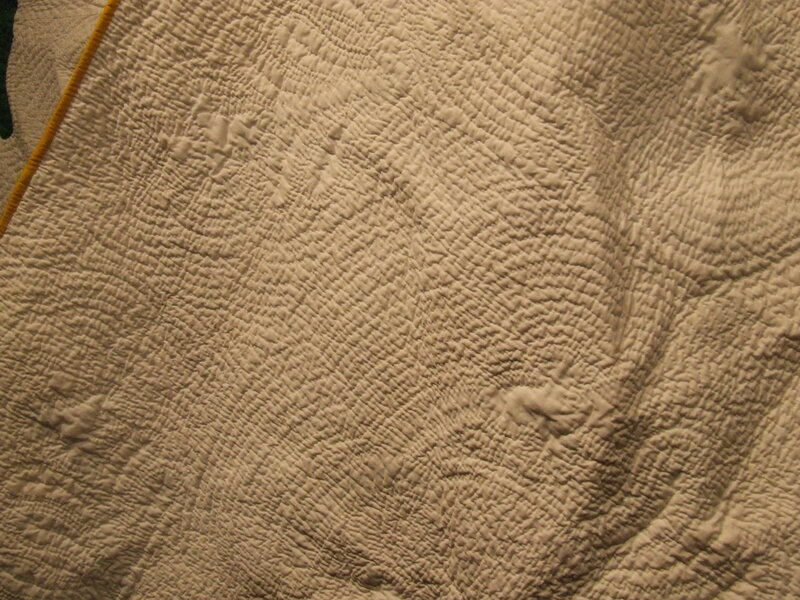 I like to immediately wash a quilt once the quilting is finished and binding on too, love the crinkled look! I’m amazed you can hand quilt with Warm ‘n Natural too. I’ve tried and just couldn’t manage it at all. I like the idea of quilting without marking. 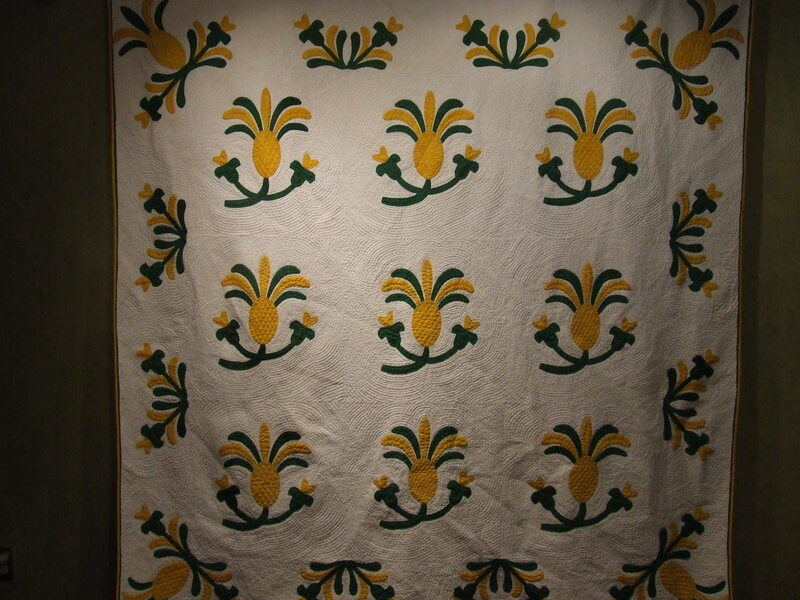 This post has given me some ideas for a quilt I’m about to start hand quilting. fantastic! I wash my quilts to and dry for the antique look. You did a wonderful fast job on that, I don’t quilt near that fast. Woo-Hoo!! 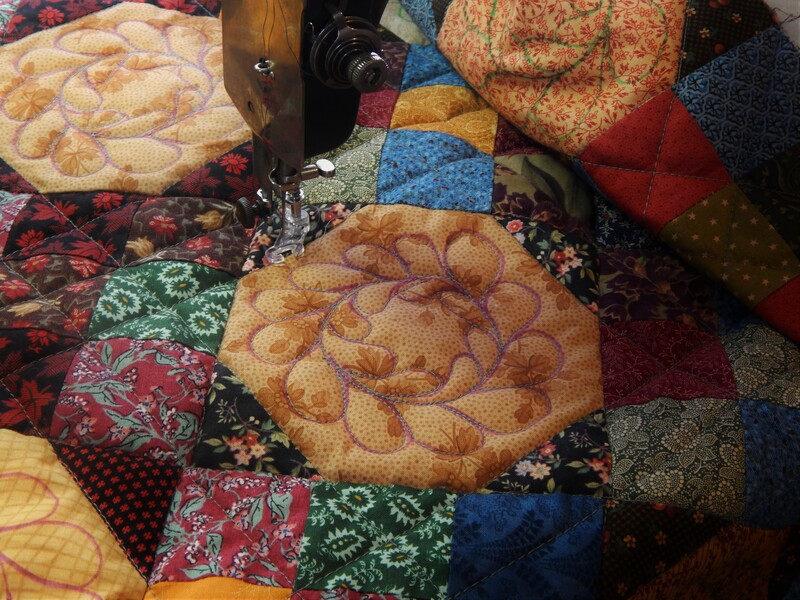 It is so lovely Tim and the quilting makes the quilt all the more special!! I wash my quilts right away too. 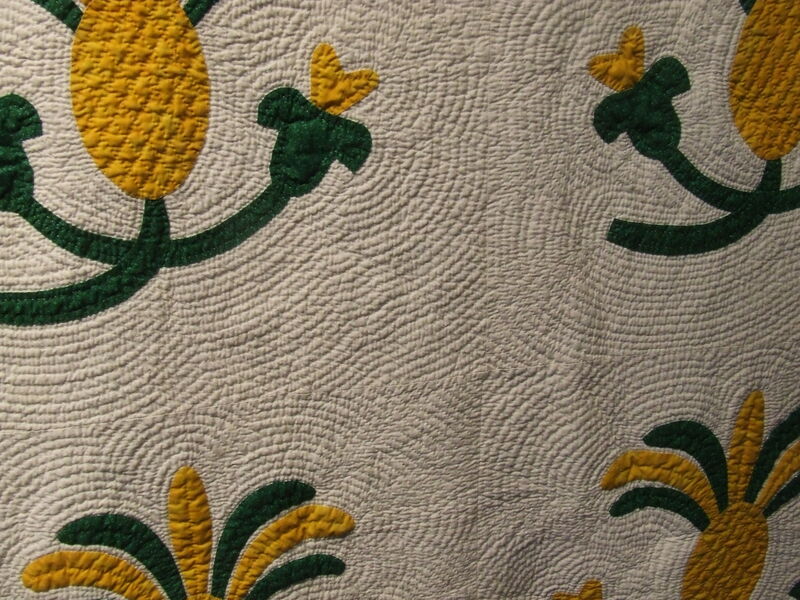 Do you use the quilts as bedspreads, ever? Or are they too fragile? What a completely fabulous quilt! Love the antique look to pieces. Bravo! Hurrrrrrrah! Looks terrific Tim. 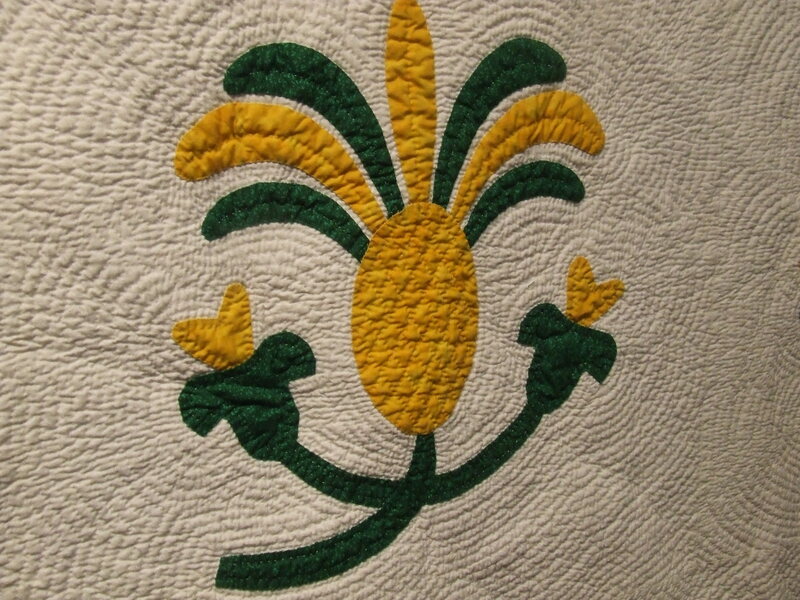 And kudos for both washing and using your quilts – keeps ’em happy I think. Phew, that’s done, you can sit back and rest on your needles – oh, no, don’t do that. It’s beautiful. Any more quilt contests coming up? no contests for a while I think….but there is an AQS show in Grand Rapids….hmmmmm…perhaps I need to do one for that? Right now I am going to work on some finishing up some of my UFO projects unntill I cant stand it and have to start a new one! Oh, please take this one to Grand Rapids. I really think you should get out there so that people can properly appreciate you and also to stuff it in the faces of those eBay sellers who harrumph about quilting being a dying to dead art. Not that they’ll be at any quilt shows, but you should wave your quilt flag! I need to get the schedule for the Grand Rapids event and see how to proceded….I have been so busy with classes and the Floral Association that I have not had time look into it…..but I will…..
Oh my goodness…oh my goodness!!! I am soooo glad I happened upon your blog today and have seen this quilt!!! This past month I have been quilting on my first fully hand appliqued quilt and I am doing the echo quilting too. So far I am about 3 rounds around about 4 blocks (20 inch blocks). 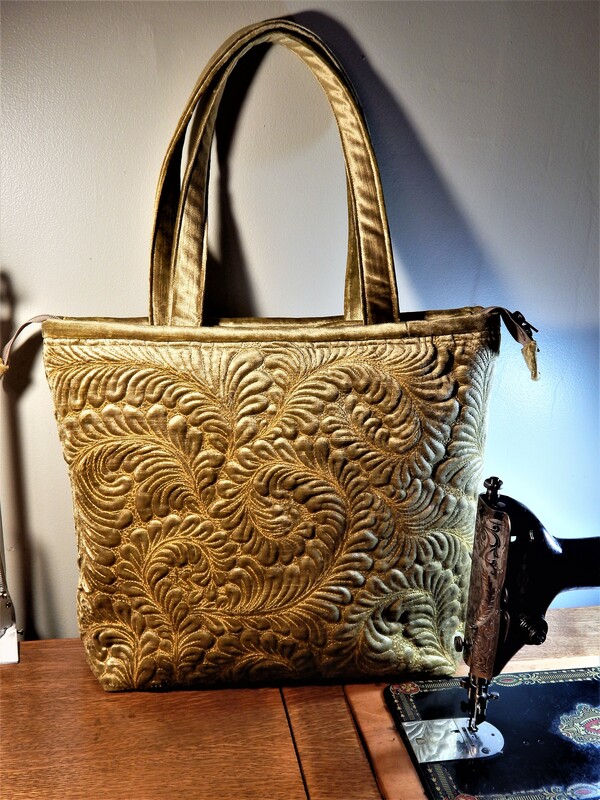 I became discouraged, put it aside the other day….debated on pulling out what I had already quilted and changing out the batting and starting all over. I have the warm & natural as the batting in mine and also use the #10 needle. 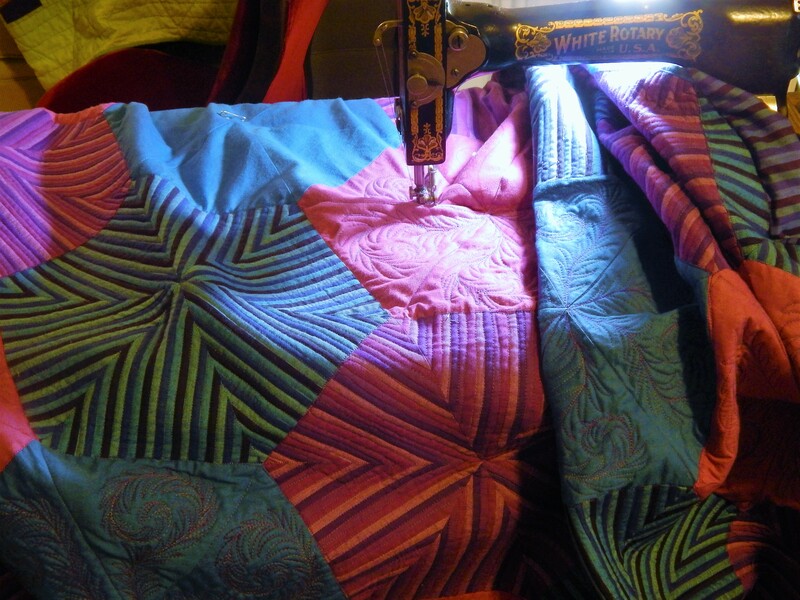 The quilting is s-l-o-w….I’m having a hard time with the needle going through the layers easy…..I can bend a brand new needle after only 3 stitches. I researched and read in numerous places that the warm & natural batting is not usually picked for hand quilting. I have done some other hand quilted quilts but think I may have used other battings….I don’t remember for sure. I was amazed to read your post and discover I am using the same supplies you have used on yours but my project is a struggle. I’m also wondering what to do with the other 2 quilts I already have basted and ready to go that ALSO have the warm & natural batting in them……ugh!! Since I am new to your blog may I also ask if you hoop/frame/or neither when you quilt. My echo stitching is puckering in some areas and I feel it was a little loose in my hoop. I soooo love to hand quilt but like I said I am struggling with this one. 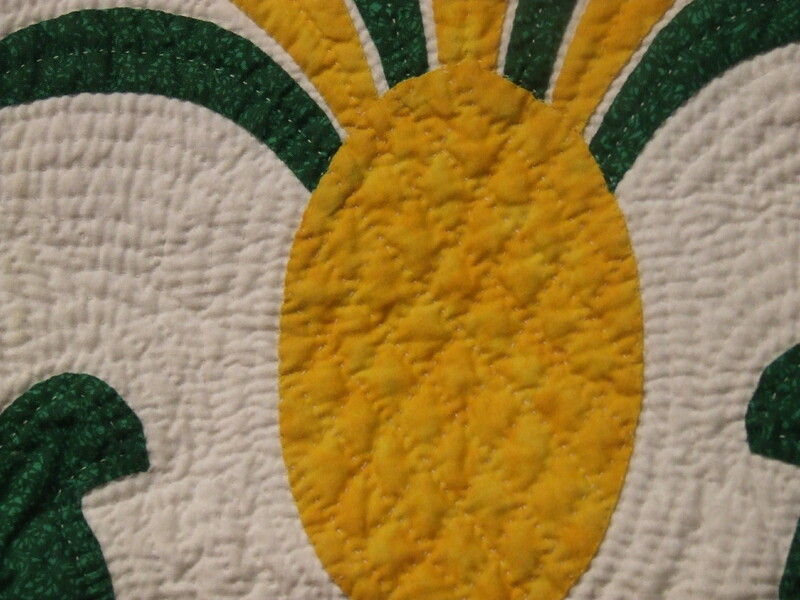 I think your pineapple quilt is FABULOUS and it encourages me to not give up and perservere!!!!!! Im so glad that you found my blog, and I hope it helps. I have done severl quilts with warm and natural, and did not realize how much harder it is to quilt throug untill I tried a different brand. Anyway it can be done and I do like the loft and weight of it so I I think it is worth it. My suggestion is to get some quality needles!…..I like John James, and I also Like Roxanne, I find the dritz, and clover, to be a gian wast of time….they bend like crazy!! 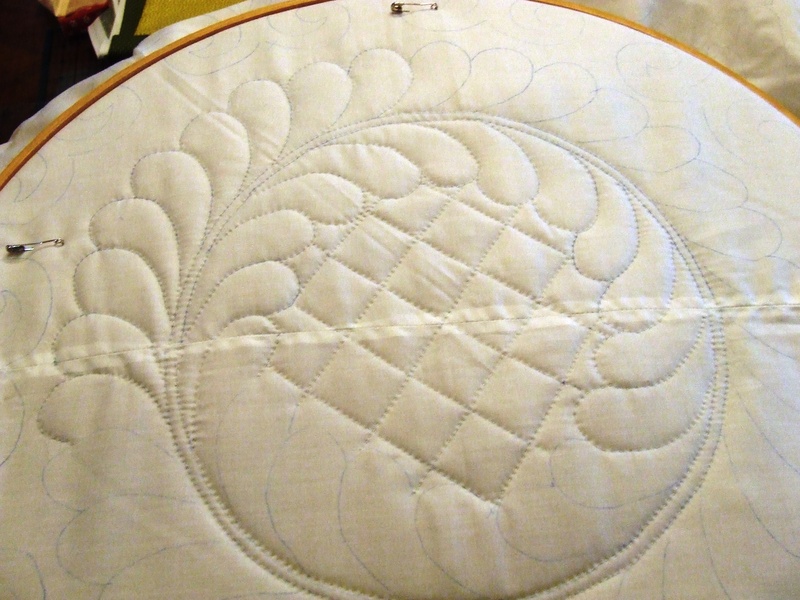 Always start in the center and quilt to the edges so that puckers can be worked out as you go. Thanks sooooo much for your reply Tim. 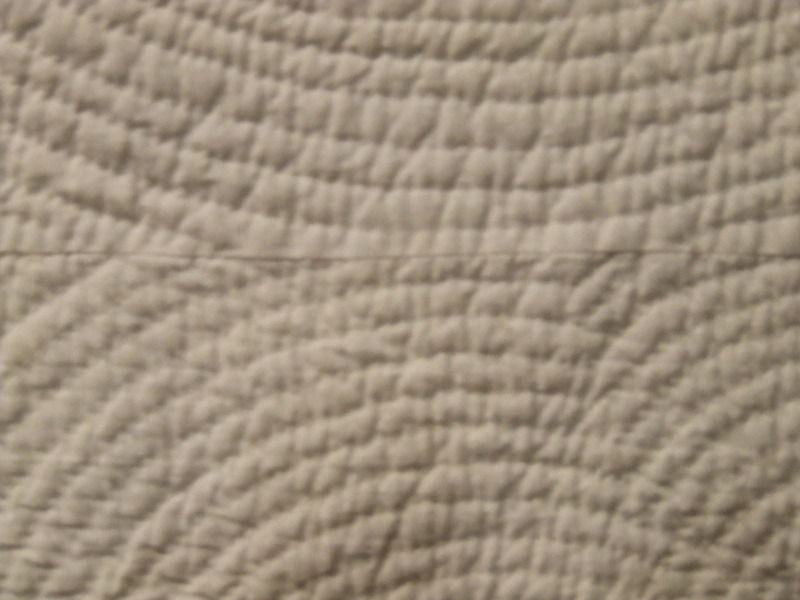 Yes, I agree about the warm & natural, I really like how it looks and feels after it is quilted. 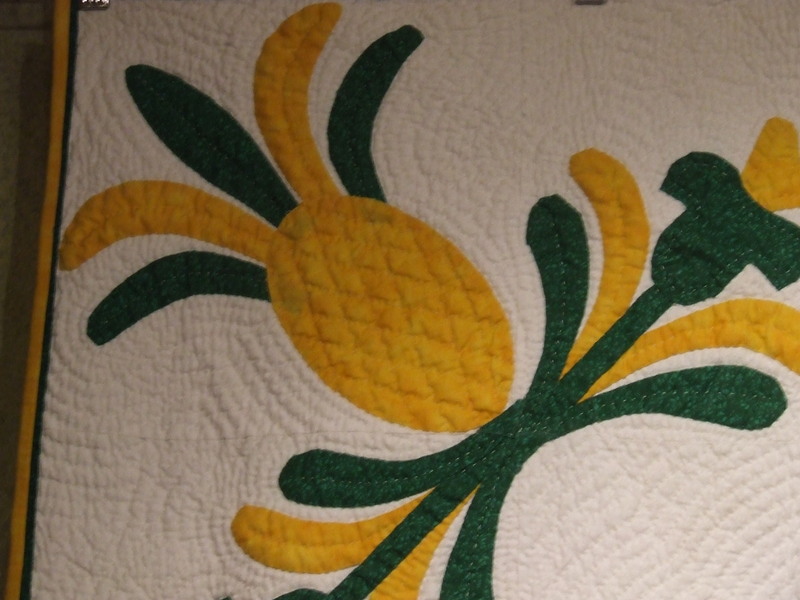 I double checked my records and I have quilted other quilts using the warm & natural but the quilt designs I used were fairly simply but I do remember there was a little resistance with the needle. I have noticed the quilting gets easier when I change directions I am quilting and then all of a sudden it’s tough again……go figure! I also agree with you that I need to get some better needles….the ones I’m using are the dritz….darn! 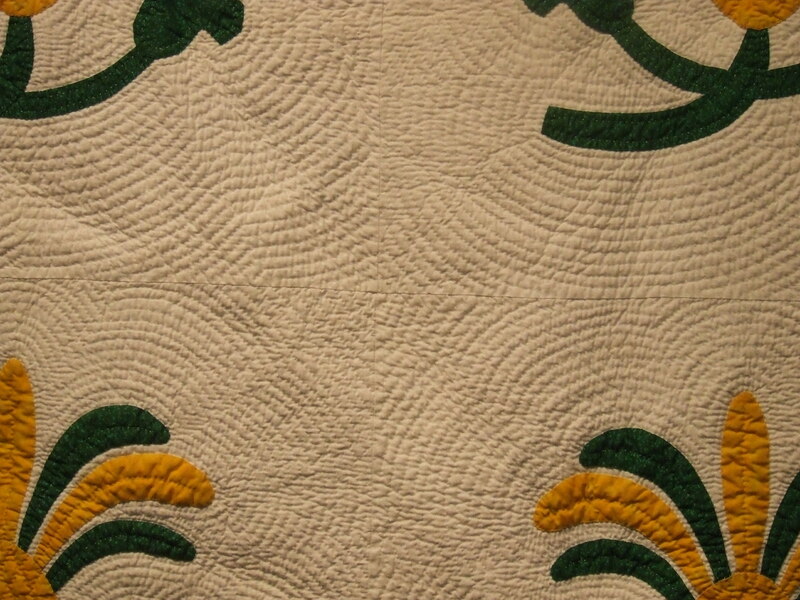 I have discovered that hand quilting blog thanks to you and my plan is to STOP LOOK and LISTEN…. make like a sponge and soak up all I can and maybe I can learn from some ole pros! Thanks again for sharing all your ‘know how’…….. Wonderful quilts to admire on your blog! Congratulations! May I ask, when it’s not warm & natural, would wool be better for hand-quilting, or if not so, which one?!?? Wool Is wonderful…it has good soft drape when finished and it is a dream to quilt …I love wool, but usually use the warm and natural cotton because the store that I buy from does not have wool….I just ordered some wool from Hancocks of Padukah on-line http://www.hancocks-paducah.com/ and will use it for my next quilt. Hi Tim: Found your blog today and love it! It is so nice to see hand-quilting being featured. I look forward to visiting your blog again. I am glad that you found it! Super job. What size is the quilt? About what size are the pineapples? Thanks Tim. Another thing to do on my bucke list. 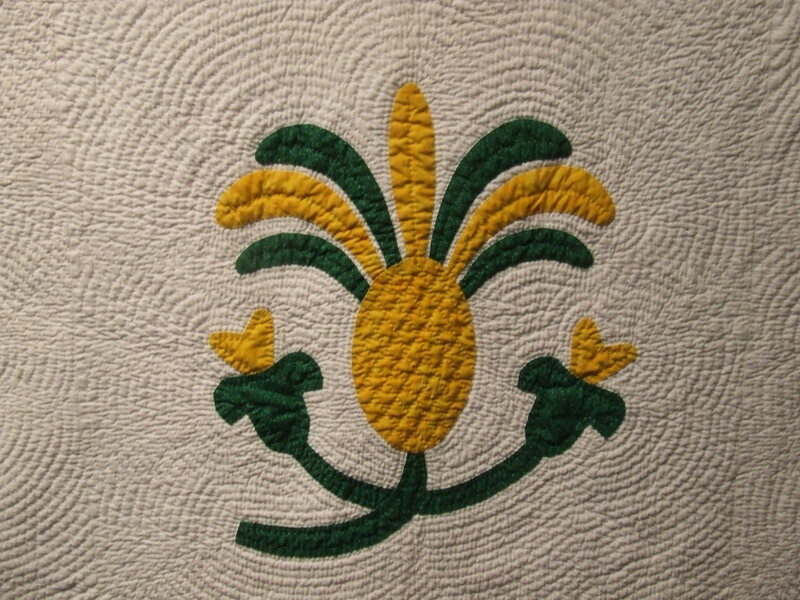 I love pineapple quilts. I do too!…someday I want to make another one….but I really really dont enjoy applique…I am just not very good at it…..your applique on the other hand is beautiful! Thank you, Tim. Another question, when you echo stitch about how far are your rows apart? I found the pattern on E-Bay. I’m excited. it’s the same pattern. Thanks for letting me know what magazine it was in..I may do it it red & green.. 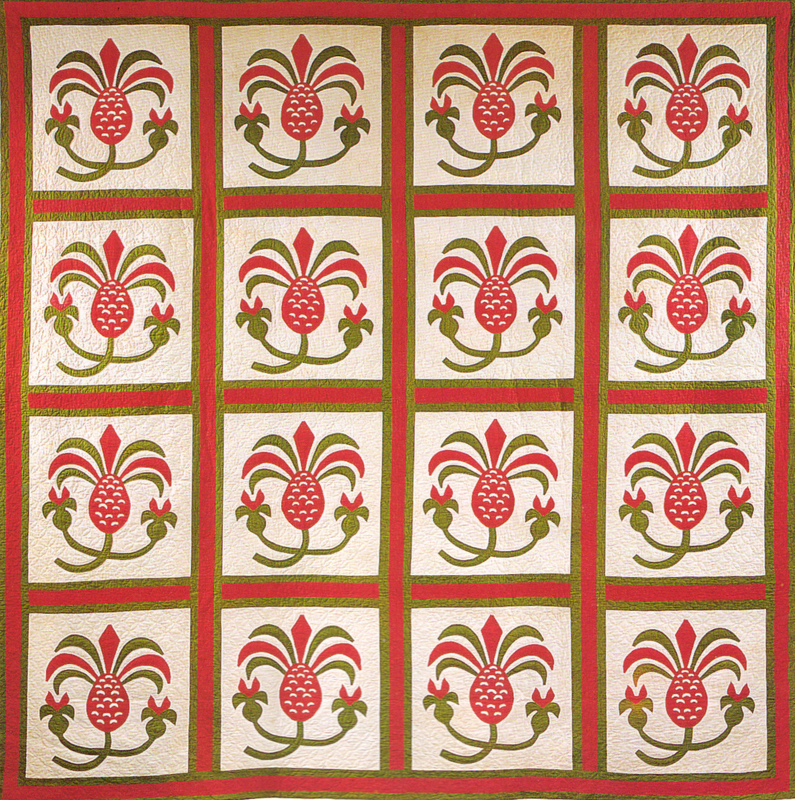 The red and green pineapple Quilt with red and green sashing is in the collection of the New England Quilt Museum. Please credit the Quilt as “Collection of the New England Quilt Museum”.